Our fourth-annual Finch Frolic Marketplace will take place Nov. 21 and 22nd from 9 – 2. We’ve been working like little permaculture elves, harvesting, preparing fruit and vegetables, canning, baking, and inventing new recipes for your table and for gifts. We have a curry spice mixture that is amazing. Our record white guava harvest has allowed us to create sweet guava paste and incredible guava syrup. We’ve pickled our garlic cloves, as well as zucchino rampicante, and our Yucatan Pickled Onions have a wonderful orange and oregano base that is fabulous. Of course there is Miranda’s small-batch Pomegranate Gelato, Whiskey-Baked Cranberry Relish, and a selection of curds (passionfruit, lemon-lime, and cranberry). So much more, too. We’ll also be selling plants from several sources, and some collectibles and knick-knacks from my home. Please come support a small business early – a whole week before Small Business Saturday! Your patronage allows us to continue teaching permaculture. Our last two Open Tours will also be held that weekend, each at 10 am. 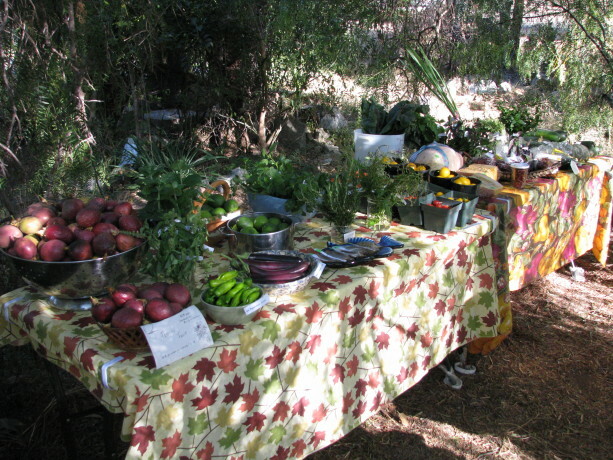 The tours last about two hours and we should be having terrific weather for you to enjoy learning basic permaculture as we stroll through the food forest. Please RSVP for the tours to dianeckennedy@prodigy.net. More about the tours can be found under the ‘tours’ page on this blog. Finch Frolic Garden will be closing for the winter, from Thanksgiving through March 1. However, Miranda and I will still be available for consultations, designs, lectures and workshops, and we will be adding posts to Vegetariat and Finch Frolic Facebook (you don’t need to be a member of Facebook to view our page!). Have a very safe and very happy holiday season. Care for your soil as you would your good friends and close family, with swales, sheet mulch and compost, and it will care for you for years. Looking for property? Creating a landscape? Planting a garden? Building a house? Diane Kennedy of Finch Frolic Garden will take you through the steps of evaluating your site for maximum effectiveness with the least labor and cost. 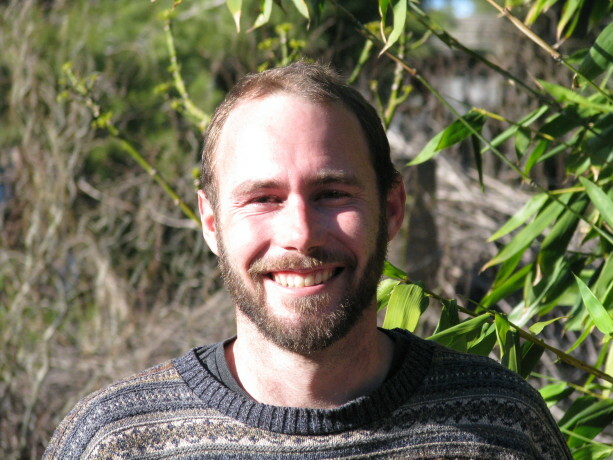 This class is for the average homeowner, with little or no permaculture background. All terms will be defined and explored. Guaranteed, you will leave the class excited about your property, and able to find new potential in it. In permaculture, 99% of the work should be in design, and only 1% in labor, so find out how to look at property with new eyes and start designing! Participants are encouraged to bring a Google Maps image of their property to work on. We will, of course, offer homemade vegetarian refreshments. Cost is $25 per person, mailed ahead of time. 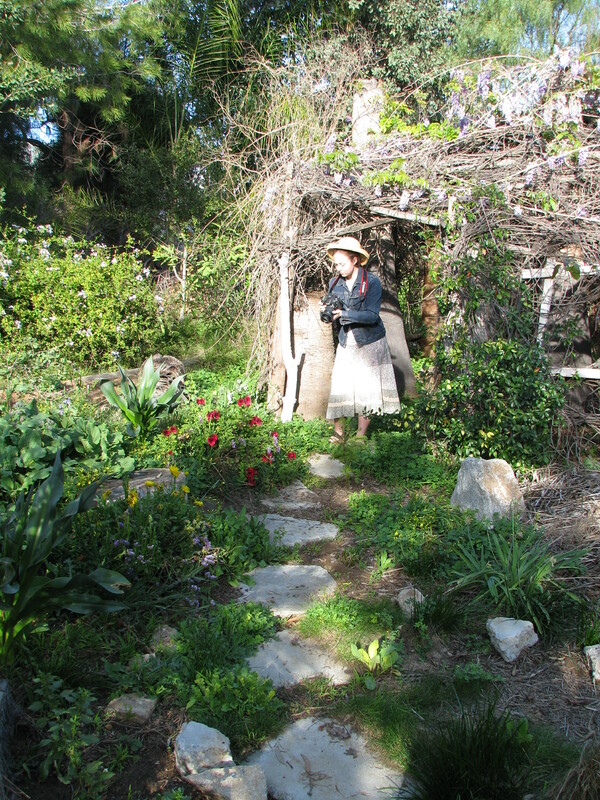 Finch Frolic Garden is located at 390 Vista del Indio, Fallbrook. Please RSVP to dianeckennedy@prodigy.net . More information can be found at www.vegetariat.com. You’ll love what you learn! Shaping the land to harvest energy and water – easily! Sunday, June 28, 2015 2-4 pm. Use 30% – 70% less water on your landscape! Jacob Hatch of Hatch Aquatics will show you how to catch free, precious, neutral pH rainwater using earthworks. Whether you use a trowel or a tractor, you can harvest that free water. Each attendee will receive a plant! We will, of course, offer homemade vegetarian refreshments. Cost is $25 per person, mailed ahead of time. Finch Frolic Garden is located at 390 Vista del Indio, Fallbrook. Please RSVP to dianeckennedy@prodigy.net . More information can be found at www.vegetariat.com. You’ll love what you learn! 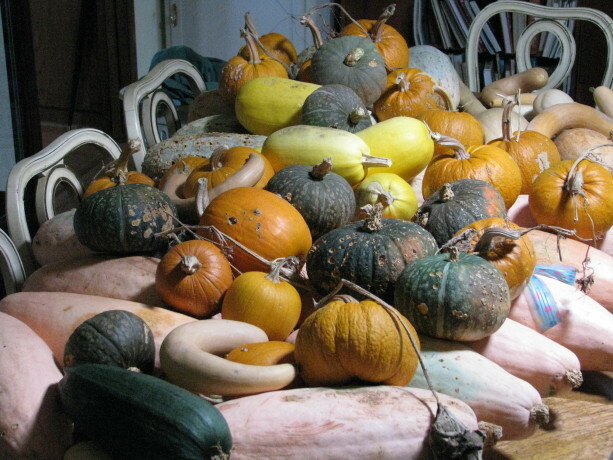 Wonderful, tasty winter squash of all kinds! Due to popular demand, we’re having one more short Marketplace this Saturday, 9 – 1. Join us on Saturday, November 29nd from 9-1 for the annual Finch Frolic Marketplace, the Extended Version! We’ll have for sale fresh and prepared foods straight from our permaculture gardens. All are excellent gifts, or will grace your holiday table. We’ll have the much-desired Pomegranate Gelato again, and new this year, Passionfruit Gelato! Squash, fruit, veg, preserves, passionfruit curd, baked goods, and much more. Herbs, veggies, frozen juice, gelatos, curds, jams, preserves… and much more! Finch Frolic Garden is located at 390 Vista del Indio, Fallbrook, CA. Finch Frolic Garden is open by appointment only for tours, lectures and other activities. The address is 390 Vista del Indio, Fallbrook, CA 92028-2548. Please call only if you are lost or delayed; we use our house phone only and are often not inside. Please use the email above for any other communication. From the North (Temecula and above): take 1-15 South to Exit 51 and turn right. Make the next right onto E. Mission Rd/County Hwy-S13. In .8 of a mile turn left onto E. Live Oak Park Rd. In 1.6 miles turn right onto Alvarado St. In .7 miles at the top of the hill turn left onto Vista Del Indio, at Roja’s Succulents. Make the very first right; 390 is at the end to the left. From the South (Escondido and below): take I-15 North to Exit 51 and turn left over the freeway. Make the next right onto E. Mission Rd/County Hwy-S13. In .8 of a mile turn left onto E. Live Oak Park Rd. In 1.6 miles turn right onto Alvarado St. In .7 miles at the top of the hill turn left onto Vista Del Indio, at Roja’s Succulents. Make the very first right; 390 is at the end to the left. From the West (I-5): take CA-76 East, Exit 54A and drive for 12.6 miles. Turn left onto S. Mission Road/County Hwy S13 for 4.1 miles. Turn right onto S. Stagecoach Lane (at the high school). In 2.8 miles turn right onto Alvarado St. At the top of the hill turn right onto Vista del Indio, at the Roja’s Succulents sign. Make the very first right; 390 is at the end on the left.